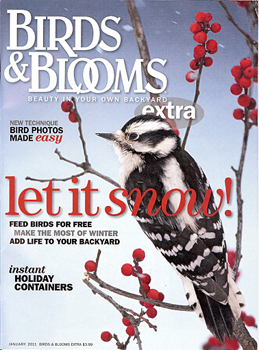 Richard Day’s Downy Woodpecker made the cover of the January 2011 issue of Birds & Blooms Extra! 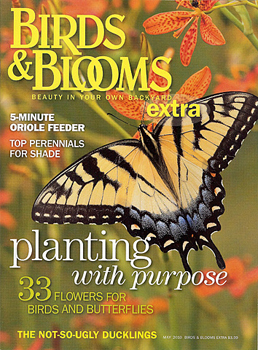 That’s his 3rd cover for Birds & Blooms in 8 months—a gorgeous male Indigo bunting in Susan’s flower bed was featured on the August/September issue and a Tiger Swallowtail butterfly on a blackberry lily landed on the May cover. For the Downy Woodpecker, Richard was sitting in his blind in our yard photographing birds at feeders. He always uses a photo blind to photograph birds because the birds are used to the blinds in our yard and go about their business because they can’t see him when he’s inside. 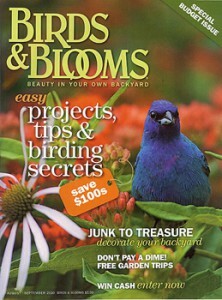 It’s less stressful on the birds overall, and that’s Richard’s highest priority when he photographs them. We don’t get much snow here in southern Illinois, so when it does snow, Richard (“the weather man-iac”—according to Susan) plans ahead. He watches weather patterns and forecasts for weeks waiting for snow in the forecast. When there’s even an inkling of a flurry, he sets up his blind near some evergreen trees in our yard. Various bird feeders are filled with sunflower seeds, niger seed, suet cakes, and chopped peanuts and placed down wind from the evergreens so the birds can have some shelter from the elements when they eat. Back on January 31, 2008, it snowed and Richard was ready. 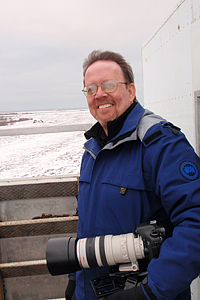 He photographed a bunch of different species like cardinals, juncos, blue jays, chickadees, and goldfinches for a couple of days before the snow melted. 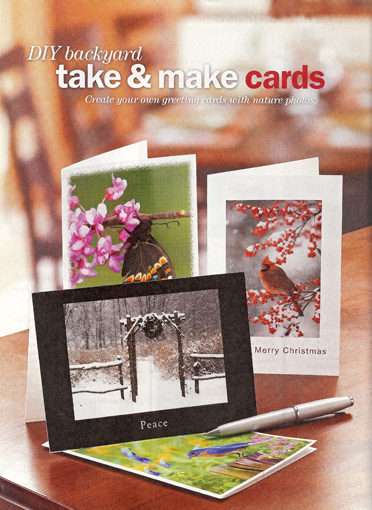 Many of those have appeared in cards, calendars, magazines, and catalogs since then. The female downy woodpecker was feeding on suet at one of his feeders. We have a patch of Common Winterberry bushes near the juniper trees where he’d placed the feeders. Winterberries (Ilex verticillata) are in the holly family and, as their name implies, their fruits don’t ripen until winter. They are great landscape plants for birds, offering nesting and cover in the summer as well as winter food for birds. Downy woodpeckers don’t eat berries, however this female hopped in the bush and stayed long enough for Richard to take a few photos of her. The Downy was photographed with his old Canon EOS 40D, (which he doesn’t own anymore) and his 600mm f/4 lens. Since it was snowing, he had his ISO set at 320, shutter speed 1/800th of a second at f/4. Polar bear season in Churchill, Manitoba is over for this year and it was another fun year on the tundra. This was my 10th year of leading tours, and I had the pleasure of guiding 4 tours for Frontiers North Adventures this ‘round. Everyone had a great time and went home with lots of good polar bear, arctic foxes, red foxes, and other arctic wildlife photos. 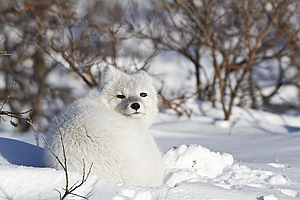 Besides the bears, highlights this year included some very cooperative arctic foxes. If you’ve ever tried to photograph arctic foxes, you know that they spend most of their time darting around with their noses on the ground sniffing for something tasty to eat. But on my first 2 tours, our buggy driver, Brian located some that were hunkered down in the snow waiting for storms to pass. Something else that was interesting this year was being able to witness and photograph seal kills by polar bears. Our tours are in the Churchill Wildlife Management Area, bordering the Hudson Bay, which has high and low tides. The seals come in on the high tides and usually wash out when tides go back out. Sometimes an unlucky seal may be napping during the low tide and gets stranded on rocks until the next high tide. The polar bears have learned to watch for these unlucky seals who become the bears’ next meal. This is amazing to watch, and people took home plenty of photos of bloody-faced bears and bears fighting over the food. They also had many opportunities to photograph mom and cubs together. Everyone asks me how global warming is affecting the polar bear population. 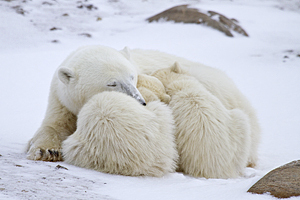 Frontiers North partners with Polar Bears International who conducts research in Churchill. Click here to learn more about polar bears. 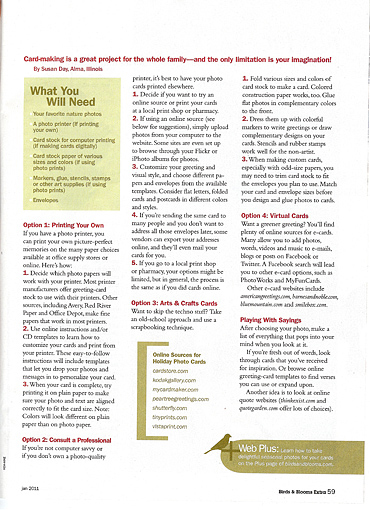 You are currently browsing the Daybreak Blog blog archives for December, 2010.